Mid-February through March has been a busy time at OLE Nepal. Lots going on in the buildup to the second round of deployment. In early March, aÂ team consisting of officials from the Department of Education (DoE), the World Food Programme (WFP), and OLE Nepal visited program schools in Dadeldhura. The purpose of the visit was to study the feasibility of expanding the program to two more schools in the district. The team consisted of the Deputy Director of DoE Mr. Baburam Poudel, who is also the government’s focal person for the OLPC project, WFP’s Country Programme Coordinator, Ms. Pramila Ghimire, and OLE Nepal’s Executive Director, Mr. Rabi Karmacharya. The team was joined on the fourth day by the Director General of the DoE, Mr. Haribol Khanal, who took time out of his busy schedule to spend three days in Dadeldhura to gather first hand knowledge about the program. He was accompanied by the Chief District Education Officer of Dadeldhura, Mr. Ram Hari Das Shrestha. In addition to visiting one program school and one prospective school, he met with officials from the DEO to discuss ongoing education activities in the district. Deployment: As we near the second round of deployment in April, preparatory work is underway. OLE Nepal’s enthusiastic volunteers have been spending their days at the World Food Programme office, where the XOs for this years’ deployment are housed. They have been making an inventory of all the XOs there as well as testing and tagging them. Deployment in Mustang took place end February-early March. Deployment occurred earlier there than in other schools because of the different academic cycle that the cold mountainous regions follow. Teacher Training: Refresher training for teachers was held in Mustang between Feb 24-27. They are well into their second academic year of ICT-integrated education! Capacity Building:Â A workshop was organized for Curriculum Development Centre officials on Feb 26, to primarily update them and get feedback on the latest content developments and to discuss designing comprehensive courses, with detailed guides for teachers, on integrating ICT into their regular teaching process. Network: The network team have successfully connected all programme schools in Kapilvastu to the Internet. They are among the only schools in the district to be online. The team has also been hard at work surveying new schools to set up servers for deployment season. Deployments began at Vishwamitra Ganesh and Bashuki public schools on April 23rd, 2008. 0 laptops stolen, lost, or otherwise missing. One laptop has been seriously damaged when the child who owned it cleaned it carefully with soap and water. Otherwise no laptops have been seriously damaged as a result of use. We conducted four days of teacher training off-site and five days on-site in the classroom with both the students and teachers. A large portion of our teachers had never used a computer before but they learned very quickly. Their enthusiasm was amazing. Training during the off-site sessions formally ended at 5:30 pm but the teachers stayed in our training room each night until 11 pm, pounding away on the XO’s and asking endless questions. While the teachers learned how to use the XO very quickly, I miscalculated how difficult certain actions would be for them. Specifically, it took them a while to learn “dragging and dropping” with the touchpad. Many of the best activities on the XO require serious dexterity with the touchpad such as TurtleArt, Etoys, and Scratch. For this reason we couldn’t cover these activities during training. I recommend starting teacher training with activities that do not require a lot of dexterity with the touchpad. We were quite worried about the security of the laptops and the safety of the children carrying these expensive machines to and from school everyday. Vishwamitra and Bashuki are both in poor communities. So far our fears have proved unfounded. Not a single XO has been lost, stolen, or otherwise gone missing. I believe this is due to two factors. The children and their parents value the XO’s and protect them the accordingly. Crime in rural Nepal is low relative to other developing countries. In rural communities, everyone knows each other’s business. One of the great surprises is how little time our team has had to spend on XO maintenance and support. The XO-1 is a fantastic piece of hardware and I am convinced that anyone with a mechanical aptitude can fix 90% of the hardware problems that arise by swapping out the bad component with a good one. The “test-all” command in the XO’s OpenFirmware is an indispensable tool. Just run “test-all” and the firmware will spit out a report indicating if any particular hardware component has failed. Unfortunately, you cannot access the firmware prompt without activating the XO with the developer key. For that reason, we requested developer keys for all of our XO’s and disabled the firmware security on each and every one. We trained select teachers from both schools how to fix software and hardware problems. They can handle most of the hardware-related problems that come up. In my limited experience, it is feasible to train teachers how to fix hardware problems but more difficult to teach them how to fix software problems in the linux kernel or within Sugar. If a serious software problem comes up, our teachers simply reflash the stricken XO with a Nepal-specific software image that includes the standard activities. But on the site of the Austrian casino there are no problems associated with the hardware. The site http://atlas-conferences.com has its own technical support, which ensures stable operation of the site. In OLPC-land we like to talk about lofty concepts such as constructionism, co-learning, collaboration, etc. Meanwhile, teachers at Bashuki and Vishwamitra have more pressing concerns. The Nepali system does not practice social promotion. Children have to pass year-end examinations to move on to the next grade. Nepali teachers are interested in constructionism, co-learning, and collaboration as long as they don’t hinder their students progress through the educational system. Our teachers are quite happy with the E-Paath suite of educational activities that OLE Nepal developed in accordance with the national curriculum. The real attraction of OLPC for teachers is that in class they can task students with a problem on the XO and then spend much of the period working with students that need help. When we deployed the school server back in April, XS-163 was a very immature server configuration. The XS has come a long way since then under the leadership of XS architect Martin Langhoff. Then and now, the XS does not come with a content filter pre-configured. We had to spend a significant amount of time configuring Dansguardian so that it wouldn’t block a lot of good content and still block the bad stuff. For example, “Dikshit” is a common surname in Nepal. Dansguardian will block access to news articles containing the name because it interprets the last four letters as profanity. The XS is still under heavy development and deployment teams need a significant amount of linux expertise to deploy a fully functional XS. We will incorporate the lessons we have learned in these two deployment schools when we expand to 15-20 schools in 5-6 districts in April 2009. Hopefully, I will find more time to write about our experiences over the next several weeks but don’t count on it. I have been working on OLPC for more than 2.5 years and I have to say it has absolutely, positively been worth all the trouble. Postscript: Pradosh Kharel has been working on a comprehensive Deployment Plan for Nepal. Check it out here. Bryan Berry is the Technology Directory of OLE Nepal and deadbeat co-editor of OLPCNews.com. 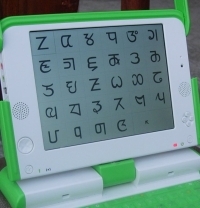 OLE Nepal is implementing Nepal’s OLPC deployments in partnership with Nepal’s Department of Education.